New deformation data from the Askja volcano, Iceland, show that the volcano's caldera has been deflating continuously for over 20 years, and confirm that the rate of subsidence is slowing down. The decay in subsidence rate can be fitted with a function of the form e − t / τ , where τ is 39 years. Reanalysis of GPS data from 1993–1998 show that these data can be fitted with a model calling for two Mogi point sources, one shallow, and another one much deeper (16.2 km depth). Pressure decrease occurs in both sources. The deeper source is responsible for observed horizontal contraction towards Askja at distances that cannot be explained by the shallower source. Plate spreading of 19 mm/year distributed evenly over about 100-km-wide zone is also favoured by the data. 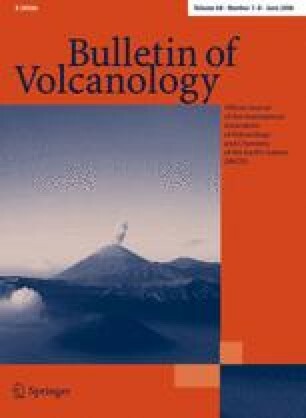 The paper is dedicated to Guðmundur E. Sigvaldason, the former director of the Nordic Volcanological Institute, who passed away on 15 December 2004. We thank him for inspiration, fruitful discussions and information, and continuous support of geodetic measurements in Iceland. The authors would like to express their gratitude to Eysteinn Tryggvason and Halldór Ólafsson for all their work in Askja that made this paper possible. We thank all of the many people that have participated in the collection of geodetic data at Askja. Colleagues at the Institute of Earth Sciences and the Icelandic Meteorological Office are thanked for their help, particularly Matthew J. Roberts. Comments from Thierry Menand and an anonymous reviewer helped us to significantly improve the paper. The figures were prepared with the public domain GMT software. This work was supported by a grant from the Icelandic Research Council RANNÍS, and by the European-funded Retina project (EVG1-CT-00046).